The fall colors train ride begins in Alamosa and travels across Colorado's San Luis Valley to Ft. Garland where it picks up additional passengers. Passengers have a photo stop in Fir, which we highly recommend getting off the train for. In the summer months, there is a special train that goes to Fir for concerts at an amphitheater next to the tracks. After going through two tunnels, the train goes over Veta Pass high in the Sangre de Cristo Mountains. Later it passes the Spanish Peaks and arrives in La Veta for an hour long stop. There are several art shops, restaurants, and souvenir stores as well as a shaded park. On the return trip, there is a quick photo stop with the Spanish Peaks in the background. The entire trip is just under 8 hours but could be shortened by getting on/off the train 25 miles east of Alamosa in Ft Garland. Besides the view of Mt Blanca, the view between the two towns is mostly flat land covered in sagebrush. 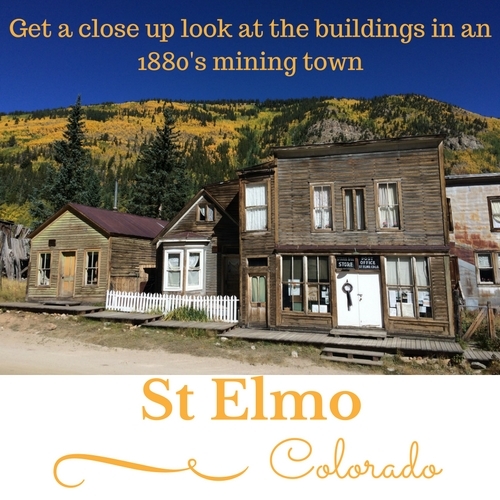 The 1 hour+ ride travels between the historic mining towns of Georgetown & Silver Plume. Due to the steep grade, the railroad had to create a unique set of bridges and curves to loop around the canyon in order to smooth out the uphill climb. Located along I-70 less than an hour west of Denver. This informative trip travels 9 miles north of Leadville to the headwaters of the Arkansas River. The regular round trip lasts 2.5 hours. The Leadville train has special wildflower trips during the summer and fall photo tours as well. Learn about area mining history while riding the steam powered narrow gauge railroad on a 3 mile journey from Cripple Creek towards Victor. During the summer months 2 trains depart about every 40 minutes for the short journey. Watch out for the black soot that occasionally lands in the open air train car. The 3 hr 10 min round trip ride on the cog railway begins in Manitou Springs and travels to the 14,114 ft summit of Pike's Peak. Riders get 20 minutes to visit the Summit House and explore before beginning the descent back to Manitou Springs. Be sure to get a fresh donut while visiting the summit house. The special recipe is only good at 14,000 ft. The Royal Gorge Route travels from Canon City and follows the Arkansas River into the Royal Gorge. The train travels a couple miles after passing under the bridge and then makes the return trip to Canon City. Duration 2 to 2.5 hours. One of the most scenic train rides anywhere. 45 miles each way. Pics & Video coming soon. Trains travel daily from Antonito, CO and Chama, NM. Ride the train 65 miles one way and return by motor coach. Pics/Video coming soon.